Happy Monday everyone! This weekend was spent getting our house Christmas ready. 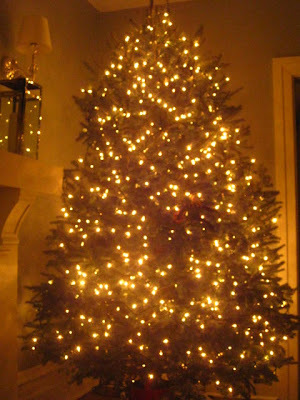 We decked the halls, got our tree and made it look pretty. Lights on, now let's decorate it! (If you look closely, you'll see our elf-on-the-shelf in the middle of the tree. That's where she hung out for the next day!) Finished tree pic to come. 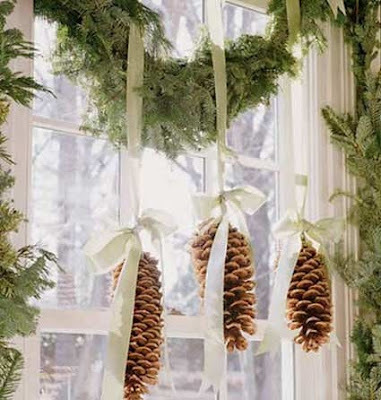 There is something so beautiful about greenery, pinecones and the smell of fresh trees at Christmas time. 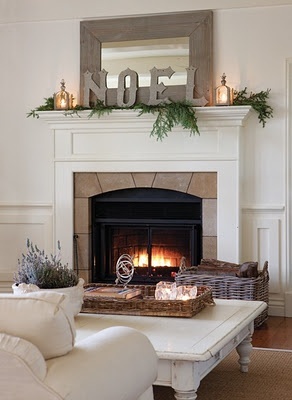 You can easily bring natural elements into your holiday decor to add to what you have, or create a cozy natural look. 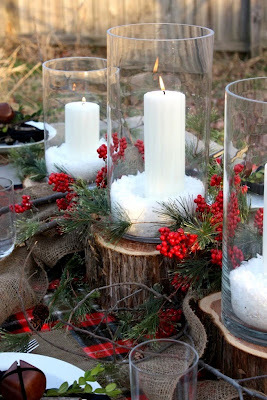 If you're looking to keep your holiday decorating simple, just by adding a handful of pinecones to a dish or hurricane lantern will create holiday beauty. 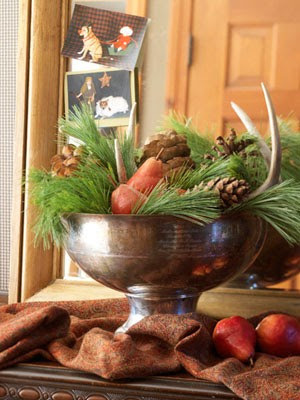 You can also step outside your door and collect a few branches and pinecones to create instant fabuloso in and outside of your home. I decided to create a natural look on our front porch using our urn. You can pay someone to do an urn for you or you can do it for very little money, or free. I did buy the magnolia leaves (which I found for a STEAL at Home Depot), and I had the pinecones and red sticks from last year, but the rest of the greenery and sticks, the kids and I collected on a walk this weekend. 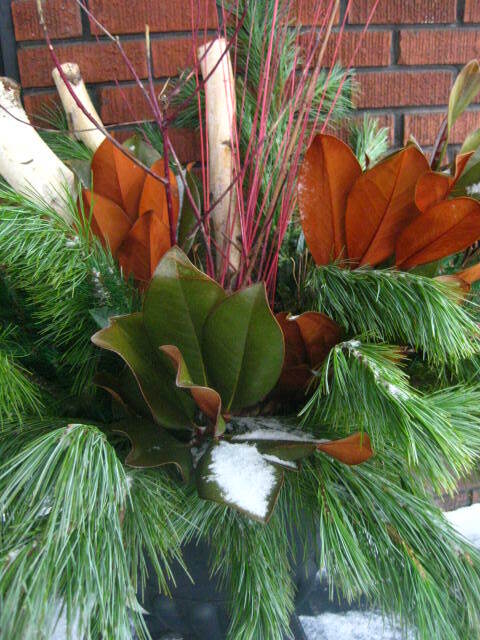 *place a small bucket into the urn, fill it with clumping kitty litter, add your greenery/display and then pour water into the bucket. 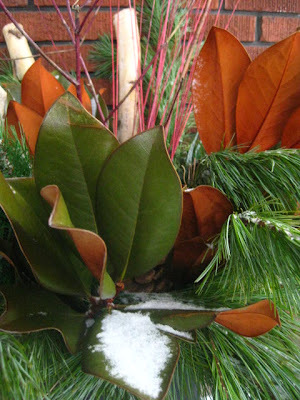 The litter will harden and freeze for the winter holding in your display. Voila! A fresh.fabulous.sophisticated way to use natural elements in your holiday decor. 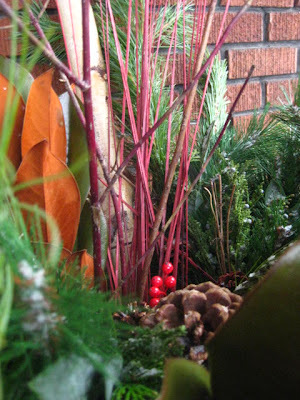 When Christmas is over, I'll just take out the red sticks and it will last me throughout the winter. Pull out a mason jar, fill with cranberries, greenery, water and a floating candle. 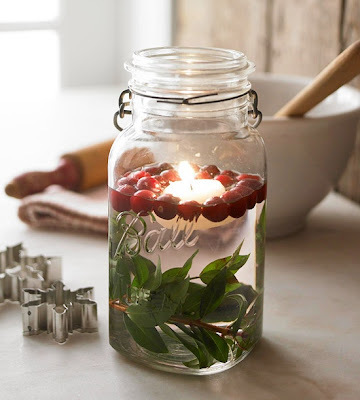 What a pretty way to light up your guest bathroom or sit on your kitchen window. 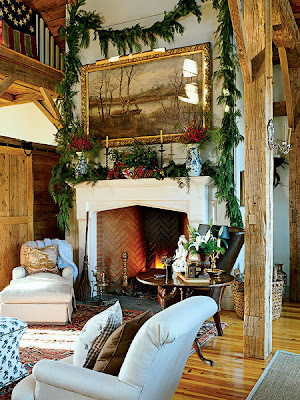 How easy, festive and pretty is this? I could definitely handle a hot cup of yummyness by this fire. Here's an important tip! 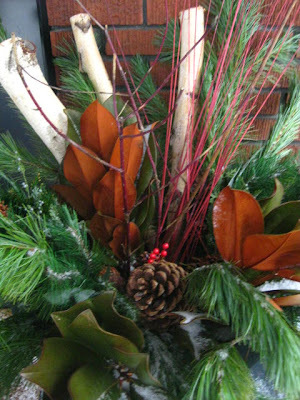 If you are bringing fresh cut boughs, wreaths and garlands into your home, make sure you spray them daily to keep fresh. Otherwise they'll start to droop and drop all their leaves. Another tip! 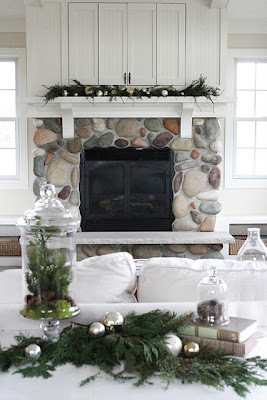 If you have unwanted branches from the bottom of your Christmas tree that need to come off, use them in other parts of your house. Instant "au natural". 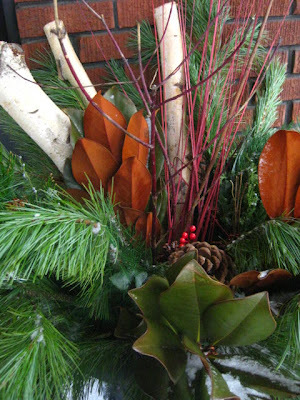 Stay tuned for this week for more holiday decor and ideas. I had to do a double take when I spotted the Magnolias. I know they don't grow where you are. Can't believe you had to pay for them. Next year, send me a note, and I'll mail you a BOX FULL of them! This post is absolutely beautiful! Glad I found you! Love you unique natural holiday decorations. I'm doing that candle in the mason jar thing! 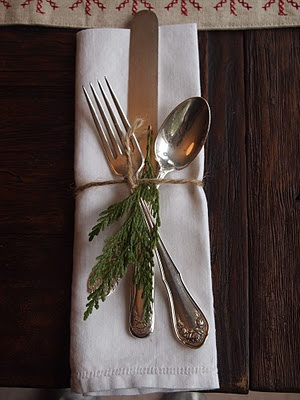 Homa Style is having a 12 Days of Christmas link party going on now. I would love it if you linked up your holiday decorating.